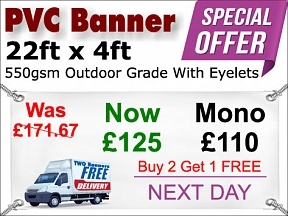 We have selected a range of the most popular banner sizes, and discounted these making them extremely affordable. How this works - Printing and making set size banners is much more efficient for us, this means we can process your order in less time with less material waste, we simply pass on the savings to you in the form of the special offer price. The saving is much greater than the 10% loyalty discount for returning customers, therefore the automatic loyalty discount can’t be applied to special offer items. Print quality, material and our outstanding service and support is exactly the same, and we still offer free delivery with two and a free design service! 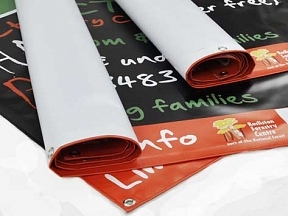 Colour Banners can include anything, with unlimited colours, photos, logos and anything you like. HFE Mono Banners consist of black text only on a white banner material, no images or logos.